After having typically appeared in the hallowed pages of Baseball Think Factory, Dan Szymborski’s ZiPS projections have now been released at FanGraphs for more than half a decade. The exercise continues this offseason. Below are the projections for the Houston Astros. Suffice it to say, the highs here are very, very high. Jose Altuve, Alex Bregman, and Carlos Correa are all threats to have MVP-caliber seasons in any given year. Yes, Correa missed significant time due to back soreness, his second season in a row marred by injury and time on the injured list. And yes, Correa did have easily the worst of his four major league seasons in 2018. But it’s still too early to call him injury-prone, and he’s 24, not 34. His age is also an important number to remember when we consider his offensive regression last year; if he were a hotshot shortstop prospect being called up for his age-23 season and had a .728 OPS in a theoretical 140-game rookie season, he’d be getting Rookie of the Year votes. ZiPS is extremely optimistic when it comes to Kyle Tucker, and if he plays as well as his projection, I suspect he will force his way into the lineup quickly, kicking off domino effect that will result in Michael Brantley or Josh Reddick getting more DH playing time, Tyler White more time at first, and Yuli Gurriel more time on the bench. Gurriel was a good stopgap first baseman, but average-ish first basemen turning 35 don’t usually have gentle aging curves. It’s likely the Astros’ weakest position and if Tucker’s pushing comes to shoving, Gurriel is the most likely to lose at-bats. Over the short-term, having Justin Verlander and Gerrit Cole at the top of the rotation means the Astros will have to have some fairly nasty surprises come their way for their staff to not be in the top third of the majors. 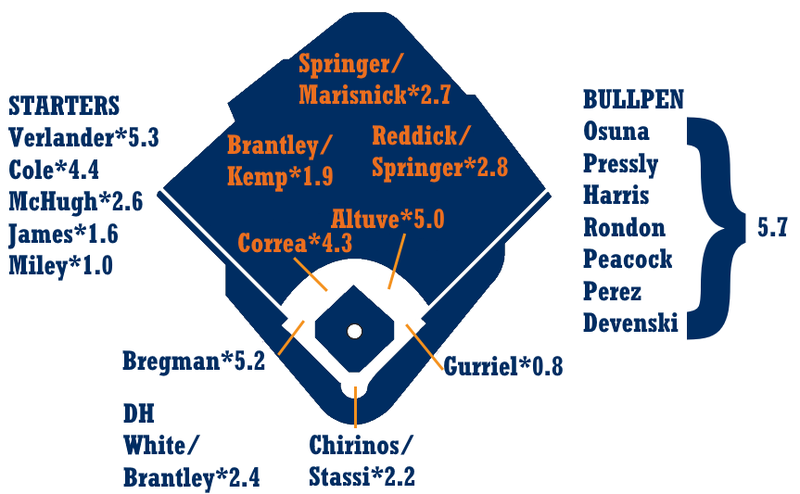 The depth is thinner, though, than it was with last year’s set, with Charlie Morton gone, Dallas Keuchel likely to sign elsewhere, and Lance McCullers missing 2019 due to Tommy John surgery. Things become more urgent in 2020, when Verlander (his vesting option was voided are part of his 2017 trade), Cole, and McHugh all hit free agency. The Astros have a lot of interesting and talented young pitching, and some part of that trio could stick around, but that’s a lot of wins to start replacing. ZiPS is far from sold on Wade Miley, and that’s without the computer having dark, dark memories of watching him try to pitch as a Baltimore Oriole. Houston’s probably a good fit for Miley, and the organization will likely do a better-than-average job at wringing the most they can get out of him, but it still pays to be skeptical right now. There’s a weird perception out there that Houston have a weak bullpen, which I feel is due in large part to the past underperformance of Ken Giles. But when it comes to ZiPS, if the Astros aren’t in the top 5 of projected bullpens when the season starts, they won’t miss it by much. It’s not the flashiest bunch, and there are obviously some non-baseball reasons to not be a fan of Roberto Osuna, but it’s a deep group. Plus, Brad Peacock can still theoretically start, even if he didn’t need to be used that way much in 2018 (his one start was a bullpen game). By getting Verlander and Cole for (relatively) light prospect packages, the Astros have been able to maintain a farm system ranking that I feel is still above-average, even if it is clearly below the game’s elite systems. Tucker is ready to start now, and ZiPS thinks Yordan Alvarez is fairly close to being a real offensive contributor, even if he has little defensive value. The computer also likes Forrest Whitley as one of the probable replacements for the pitchers Houston has lost, and thinks other pitching prospects (Cionel Perez, Corbin Martin) are capable of contributing in the majors without any face-splat-ation. I share our friend Carson Cistulli’s fascination with lesser prospects, and one starter in particular sings to me. That is pitcher Rogelio Armenteros, who sometimes checks in toward the bottom of the top 10 on Houston prospect lists, but can generally be found in the teens. A low-profile Cuban defector some years ago, Armenteros doesn’t throw hard, generally in the low-90s. But while it seems unlikely that he’ll be a star, he’s also a guy with good command of a number of pitches, none of which are actually bad: two fastballs, a curve, a slider, and a changeup. He has also survived a whole season in the Pacific Coast League, so he’s no Hi-A hurler striking out helpless organizational players with mediocre stuff. The Astros talked about him possibly playing in the majors in 2018; that he didn’t has more to do with the fact that they didn’t need the depth than him, with only seven pitchers getting starts (the aforementioned Peacock and Chris Devenski each started one bullpen game). A high-floor pitcher may prove to be mighty useful if the Astros have some rotation upheaval. Dean Deetz mostly got attention last year for drawing an 80-game suspension, but he might have received more playing time in the majors in 2018 if not for the unexpected vacation. I haven’t forced ZiPS to project him exclusively as a reliever yet, though I may before the start of the season depending on how the spring plays out. If his control can improve just a little, he’s got that upper-90s fastball and a really nasty slider, and spiked to 14 strikeouts per nine innings in the minors, up from 10.3 and 8.8 the previous two seasons. We hoped you liked reading 2019 ZiPS Projections – Houston Astros by Dan Szymborski!